So there was a problem with me getting my card posted earlier. I had it almost all done. 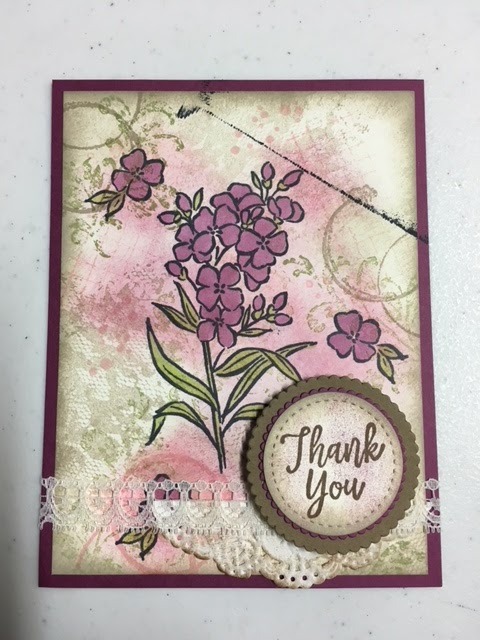 I was stamping a tiny flower image from the "Southern Serenade" on a 4" x 5-1/4" piece of Very Vanilla for the inside of the card. Something that could have waited until after the card was posted. But no, I had to make the inside right away! And I dropped the ink pad on my 100% finished card. UGH!!! I added the photo below so you could see it. It's not even fixable! So the top card is the new finished card without the ink pad mark on it!! First I stamped the flower image from the "Southern Serenade" set using black Memento ink. Next I stamped the coffee ring looking image from the "Timeless Treasures" set, I used Crumb Cake ink for that. I used the grid looking image from "Timeless Treasures" and Pirouette Pink ink. I stamped it on the upper right corner, left side near the single flower and at the bottom, it's under the "thank you" and doesn't show up. I stamped the lace piece from the "Southern Serenade" set using Crumb Cake stamped off once. I stamped it on the upper part of the card, across the top edge. Along the left side and over the bottom right corner. I stamped off with each one. Then I took the fleur dis lis looking image from the "Timeless Textures" set ad I stamped Pear Pizzazz directly from the pad. I also used the Pink Pirouette ink on the small dotted image from the "Timeless Textures" set. I filled in some of the open areas with it. I stamped once and then stamped again in another spot. In the open areas I stamped the small flower image from the "Southern Serenade" set using black Memento ink. And that took care of the stamping. I colored in the flowers using the Rich Razzleberry light Blends pen on the flowers. I used Old Olive light to color in the leaves and stem. I added tiny pearls to the center of each flower. The words are from the "Southern Serenade" set and I stamped them using Soft Suede ink. I sponged some Rich Razzleberry lightly over the thank you and then I sponged the edges with Crumb Cake ink. I also added a little over the words. I used the Stitched circle die to cut the words out. Behind that is a scalloped piece of Rich Razzleberry and then a piece of Soft Suede for the back layer. I added Dimensionals and set it in place. I cut a piece of doily, about 1/3 of the doily, it's about 3/4" wide at the thickest point (the center). I taped the stamped piece to the Rich Razzleberry layer together. Then I sponged the doily with Crumb Cake ink. I took a piece of the lace ribbon and wrapped it around the two layers. I taped it on the back using scotch tape. I added a little tape to the doily and slid it under the lace ribbon. I taped the two layers to a folded half-sheet of Soft Suede card stock. Next I set the words in place using Dimensionals and for the finishing touches I added tiny pearls to the center of each flower. It was fun but frustrating because of the ink pad mishap but I was able to create another one and all is well! !